Below are the sportsbooks that take online banking deposits in one form or another. Emailing money is a nice deposit option for Canadians but only Bodog currently offers it. The only slight drawback is the time it could take for the funds to be available to you. Bodog has to accept the transfer and credit your account which could take anywhere from an hour to a day to complete. If you want to fund your account late a night and bet immediately you may want to look into other sportsbook deposit methods which are quicker. Bodog is also the only online sportsbook offering Bill Pay as a way to fund a sports betting account using online banking. This method is slow to complete, usually a few days, so we prefer using Email Money Transfer instead. 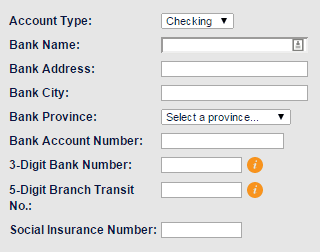 Electronic checks can be used at Sports Interaction and Bodog to instantly deposit into your sports betting account. The only drawback if you have to know information about your bank and checking account to provide all the necessary information to the sportsbooks for the deposit to go through successfully. The following is the deposit screen for Sports Interaction to give you an idea of the information required to send an eCheck. Sports Interaction and 888sport offer Citadel as a sportsbook deposit method and it works quite well. Basically you’ll download a small program that runs on your computer and you can log into your online banking as usual to make a deposit to your sports betting account. Please note that PC Financial is not supported at this time. Citadel charges $1.50 for the deposit, regardless of amount which makes it one of the cheaper deposit methods out there for Canadians. What are Online Banking fees? Overall, online banking fees are quite low. Most banks charge a nominal ($1-2) fee for making Interac e-mail transfers. Making bill payments online is typically free. Sending an eCheck is also free and Citadel deposits cost $1.50. What are Online Banking limits? Bodog allows a maximum deposit of $1,000 per day when you use bill payment. For Interac e-transfer deposits, different banks have different maximums per transaction. Your online banking payment will be send in your account currency (if you’re Canadian, then Canadian). If a currency exchange is required for your sportsbook account, the bank will pay your sportsbook the equivalent of your payment in the appropriate currency. There are a lot of online banking deposit options available if you’d prefer to use it to fund your sports betting account. The best option will depend on a few factors such as which sportsbook you want to bet with and how fast you would like to start playing.